ETA Joey Cundari during his excellent competition performance at the Niagara Falls Elvis Festival. Photo Credit: Lori-Anne Crewe, LA Crewe Photography. “Joey is an awesome entertainer!” Kathy Murrell’s comment on SIDEBURNS Magazine in response to Joey Cundari’s Photo Feature aptly describes the talented ETA, Joey Cundari. ETA Joey Cundari. Photo Credit: Carolyn MacArthur. 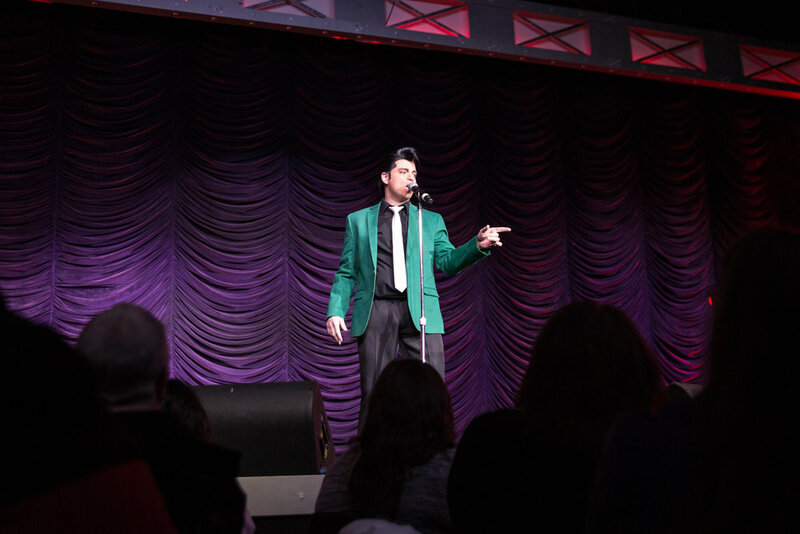 I had the pleasure of seeing Joey perform at the Bronte Legion in Oakville last year in the Darren Evorglens and Friends show, and in competition this past April at the Niagara Falls Elvis Festival where he placed in the top ten. Joey won the Early Years competition at the Collingwood Elvis Festival in 2010, and placed first at Elvis and Friends, Burlington, Ontario in 2016. I wish to thank Joey for sending along the following bio to post on SIDEBURNS Magazine. We wish him continued success with his career and look forward to seeing him in upcoming shows and competitions. Joey’s next show is scheduled for Saturday, July 14th, 2018 at the Royal Canadian Legion 15, 80 Mary St., Brampton. Joining Joey, for what is sure to be an evening of wonderful entertainment, are Chris Cooper as MC and Tyra Johnson with her Tribute to the Divas. Doors open at 7 pm. The show starts at 8 pm. Tickets are $25. Have a great show! Cheers, Carolyn. Joey Cundari lives in Brampton Ontario. He has been an Elvis tribute artist for over ten years. He is a multi-award winning Elvis tribute artist, with wins in Canada and the U.S. When Joey is not paying tribute to Elvis, he is a school teacher. He teaches French and has been teaching for 16 years. Joey enjoys singing and keeping the memory of Elvis alive.